Everyone’s favourite feuding on again off again band of ‘soft rock cocaine enthusiasts’ have announced a huge tour for 2019. The rumours are true – get ready for some serious crowd sing-alongs of Go Your Own Way and rocking out to the epic ending of The Chain, stadium superstars Fleetwood Mac are touring again. 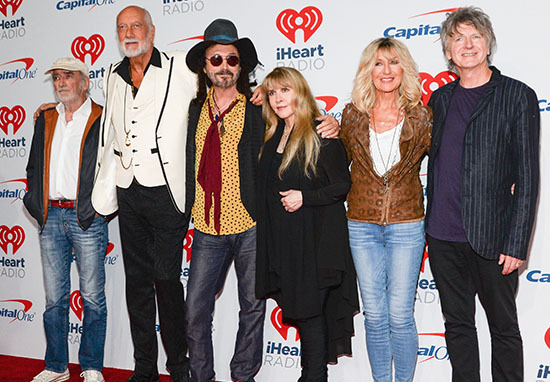 Taking in stops at Berlin, Dublin and, of course, London’s Wembley Stadium, the summer of 2019 will see Stevie Nicks, Christine McVie, John McVie and Mick Fleetwood reunite yet again. One notable absence, however, will be the band’s guitarist Lindsey Buckingham, who departed the band earlier this year over ‘scheduling conflicts’. Instead, Heartbreakers’ guitarist Mike Campbell, and Crowded House frontman Neil Finn will join the group. Fleetwood Mac has always been about an amazing collection of songs that are performed with a unique blend of talents. We jammed with Mike and Neil and the chemistry really worked and let the band realise that this is the right combination to go forward with in Fleetwood Mac style. We know we have something new, yet it’s got the unmistakable Mac sound. We are thrilled to welcome the musical talents of the caliber of Mike Campbell and Neil Finn into the Mac family. With Mike and Neil, we’ll be performing all the hits that the fans love, plus we’ll be surprising our audiences with some tracks from our historic catalogue of songs. Fleetwood Mac has always been a creative evolution. We look forward to honouring that spirit on this upcoming tour. So far, the band have announced three dates for the summer: Waldbühne in Berlin, Germany on June 6, 2019; the RDS Arena in Dublin, Ireland on June 13, 2019, and Wembley Stadium, London, UK, for June 16, 2019. Tickets go on sale from 9am on Friday, October 26. Earlier this month, it was announced that Lindsey Buckingham was suing his former band after they dismissed him. The singer and guitarist is claiming he has lost an estimated $12 million in upcoming tour proceeds, after the band unceremoniously parted ways with him in January. He is now suing the band for breach of ‘fiduciary duty, breach of oral contract and intentional interference with prospective economic advantage’. It’s not entirely clear what led to the falling out (this time) between the band members, though Buckingham’s suit suggests a conflict in touring schedules. Everything that we wore on our sleeve, the discord and nature of the band, was the people breaking up, the dysfunction, [but] right below all of that dysfunction is a great, great deal of love. If course, this isn’t the first time Buckingham has been absent from a Fleetwood Mac tour. When the group decided to tour in 1987, after a five-year hiatus, the guitarist backed out at the last minute. While, before another tour in 1998, Christine McVie left the band, before rejoining in 2014.